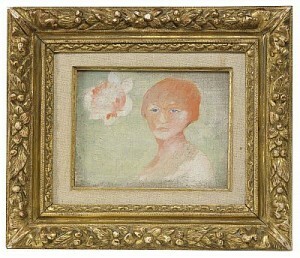 Oil on wood, 35x25 cm, signed "Renoir". 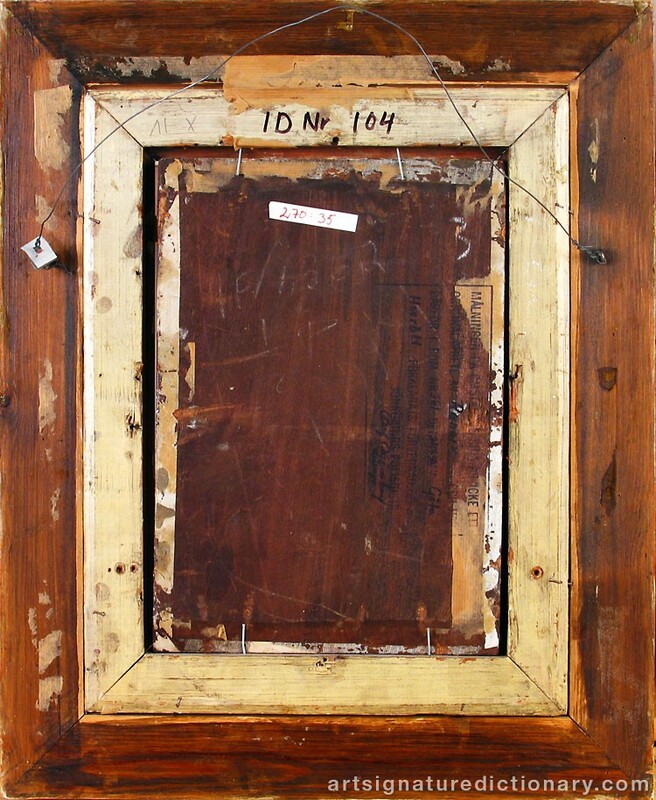 The painting is covered with thick varnish. The signature is located midway through the varnish. It is therefore signed afterwards. 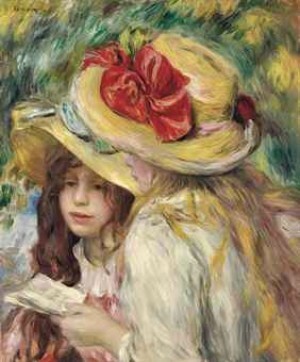 Renoir often painted children in the countryside. The painting is clumsily painted. It is sticky, heavy and awkwardly performed. It is not painted by Renoir. 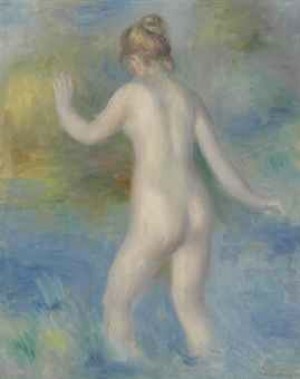 The district court's assessment: The painting is signed after the event in order to mislead the market by mimicking Renoir. It has thus been made to a forgery. Oäkta förfalskning. 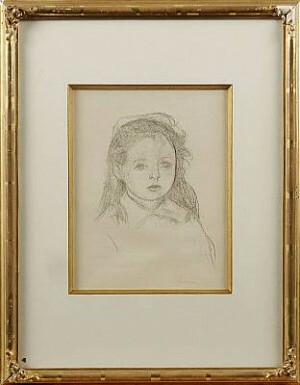 Oljemålning på träpannå, 35x25 cm, signerad Renoir. Målningen är täckt av tjock fernissa. Signaturen ligger halvvägs in i fernissan. Några andra förändringar finns ej. Den är således i efterhand. 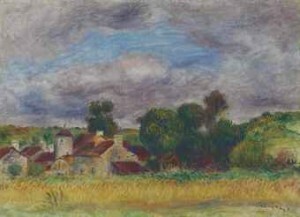 Renoir målade barn i landskap. Målningen är oskickligt målad. Den är kladdigt, tungt och klumpigt utförd. Den kan ej förväxlas med Renoir. Tingsrätten bedömning: Målningen har signerats i efterhand i syfte att vilseleda marknaden genom att efterlikna Renoir. Den har därmed gjorts till en förfalskning. Oil on canvas, not framed, 60x90 cm, unsigned. 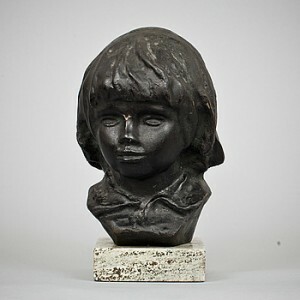 Part of a major seizure of counterfeit art in Stockholm, where large amounts of artwork by several famous artists such was found Gustav Rudberg, Edouard Manet, Mikael Ancker, Alfred Sisley, Lars Norrman etc. Olja på duk, ej ramad, 60x90 cm, osignerad. Ingår i ett större beslag av förfalskad konst i Stockholm där stora mängder konstverk av flera kända konstnärer anträffades bl.a. Gustav Rudberg, Edouard Manet, Mikael Ancker, Alfred Sisley, Lars Norrman m.fl. 1890, Signed in the plate. 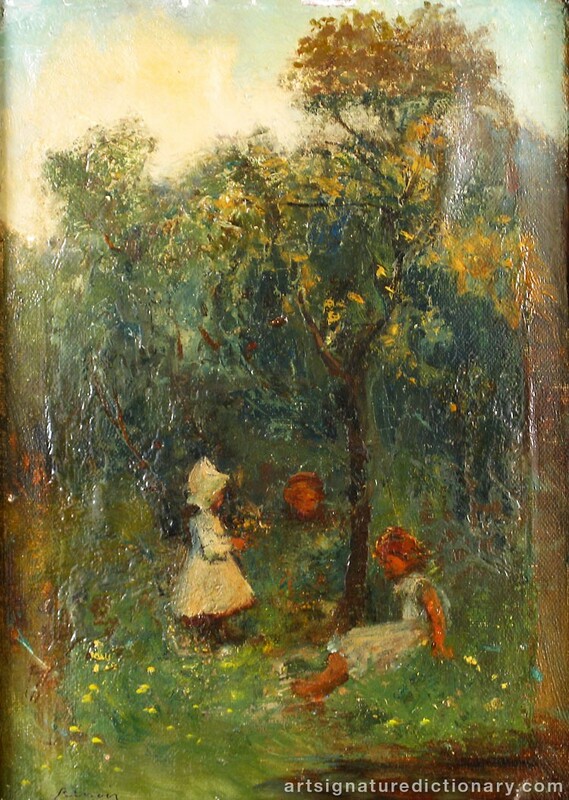 ca.1900, Signed in the plate. 1904-1908, Stamp signature. 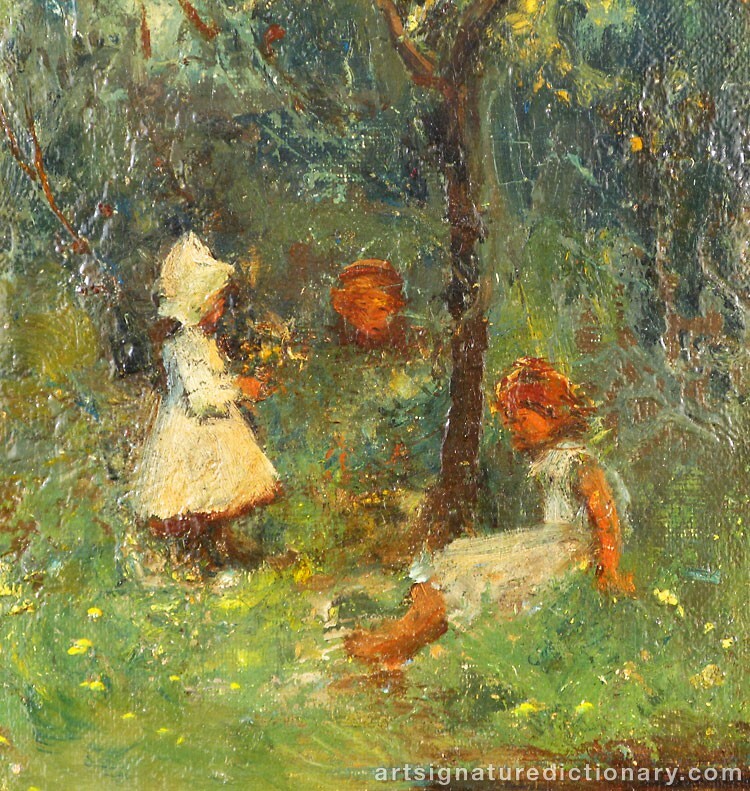 "Paysage, entrée de village avec femme et enfant". 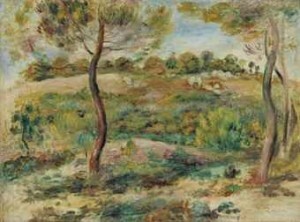 1910, "Aloès, la cueillette à Cagnes"
On January 24, 1860 Renoir was granted permission to copy in the Louvre, a practice that he maintained for the next four years. At this time Renoir had a taste for eighteenth-century masters, including Fragonard, Lancret, Watteau and above all Boucher. Boucher\'s Bath of Diana was the first painting that he adored and he continued to love it all his life. 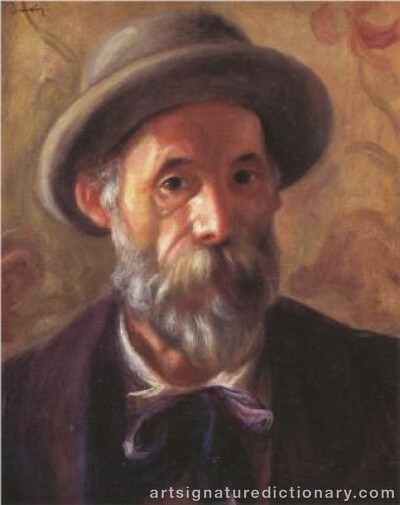 By the following year, 1861, Renoir had begun attending the studio of Marc-Gabriel-Charles Gleyer, a Swiss teacher who offered practical instruction to a number of artists. 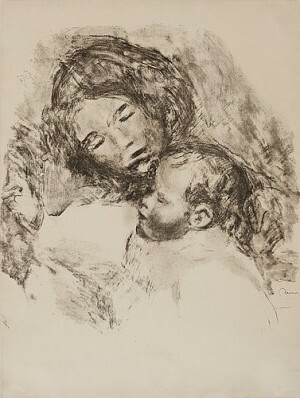 At the same time Renoir enrolled at the Ecole des Beaux-Arts and he was there from 1 April 1862 until a couple of years later. 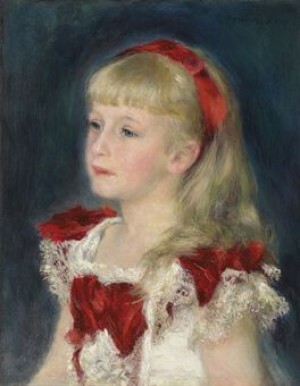 In 1863 Renoir may have submitted a work to the official Salon (an annual exhibition of paintings chosen by the jury) but if he did it seams that the jury refused it. At the Salon the following year Renoir had his first success - the painting entitled Esmeralda Dancing with her Goat around a Fire Illuminating the Entire Crowd of Vagabonds, which he destroyed after the exhibition. At the Gleyre\'s studio Renoir worked with other young artists with whom he had become friendly and these were the future Impressionist painters Claude Monet (1840-1924), Alfred Sisley (1839-1899) and Jean-Frédéric Bazille (1841-1870). Other artists whom he met around this time were Henry Fantin-Latour (1836-1904), Camile Pissarro (1830-1903) and Paul Cézanne (1839-1906). By 1863 the nucleus of the future Impressionist group was formed. 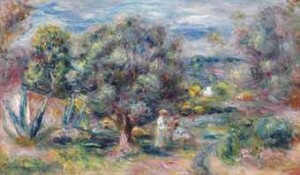 Typical Renoir’s work from this period include Mother Anthony\'s Inn at Marlotte which although pointed in the forest at Fontainebleau is a genre scene painted indoors, and Jules le Couer in Fontainebleau Forest, a work which was clearly painted in the studio, perhaps based on sketches done in the open. 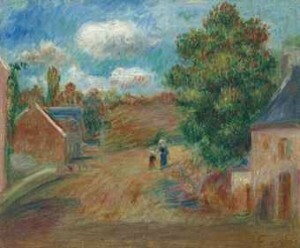 Jules le Coeur (1832-82) owned a house in Marlotte at which Renoir was frequently a guest at this time. At the end of 1865 Le Coeur introduced him to the seventeen-year-old Lise Tréhot who became his lover and model until her marriage in 1872. 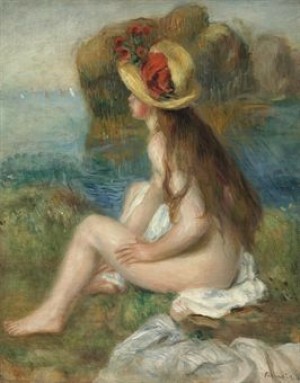 She posed for a number of works and modeled for the paintings Renoir submitted to the Salon, such as Diana, Lise with a Parasol, Summer, Bather with Griffon and Woman of Algiers. 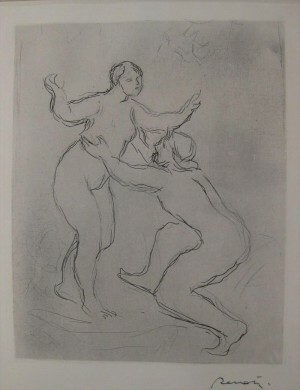 Because those works were destined for the Salon they tended to be rather conventional in their composition and very smoothly executed but at the same time Renoir was painting much more informal works in which the traditional distinction between sketch and finished painting was gradually being eroded. In 1869 Renoir and Monet worked together and produced what are usually regarded as the first landscape paintings in which the impressionist style of painting is properly evident. Working at La Grenouillère on the Seine near Bougival, Monet and Renoir executed a number of works and seven are known today. The Renoirs works at La Grenouillère are painted on fairly small canvases and their lack of finish betrays a rapid execution typical of works done out of doors, capturing the essentials before the light changes dramatically. Compared with another early landscape painting, one of the most dramatic changes in the works done at La Grenouillère was in the artists’ use of color. Both Renoir and Monet have increased the general brightness of the work by the use of color complementary, particularly the juxtaposition of red and green in the boats. One of the principal tenets of the impressionist method, that the local colors of objects are affected by their neighbors, is observed here. The composition is a very conscious construction, held together by the lines of the horizon and the jetty. 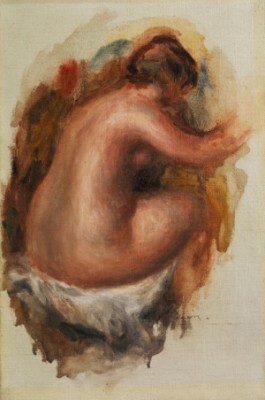 The following year Renoir had two figure paintings accepted at the Salon – Bather with Griffon and Woman of Algiers, for both of which Lise had posed. Certain conventions in the depictions of North African themes had been established by Delacroix (1789-1863) among others, after French colonization in the 1830s and these would have helped to lend to the works appear and accessibility. The availability and sensuality of Algerian woman was seen as indisputable. On 19 July 1870 France declared war on Prussia and the following mount Renoir was mobilized. Whether because of family commitments or out of an unwillingness to support Napoleon III’s political régime, most of his artist friends avoided being drafted. In London Monet met a Parisian picture dealer, Paul Durant-Ruel, whom he introduced to Renoir in summer of 1872. That year Durant-Ruel bought a flower still life and the Pont des Arts from Renoir. Shorty thereafter, Renoir moved into a studio at 74 rue Saint-Georges where he painted some of his most memorable scenes of Parisian life and which was to be the center of his life for the next decade. 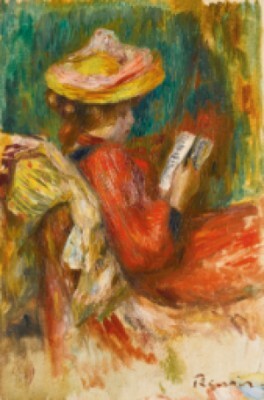 Renoir was decided not to submit to the official Salon the following year but to stage an independent exhibition with his friends. In the summer of 1873, Renoir went to stay with Monet nine kilometers north-west of Paris on the Seine. 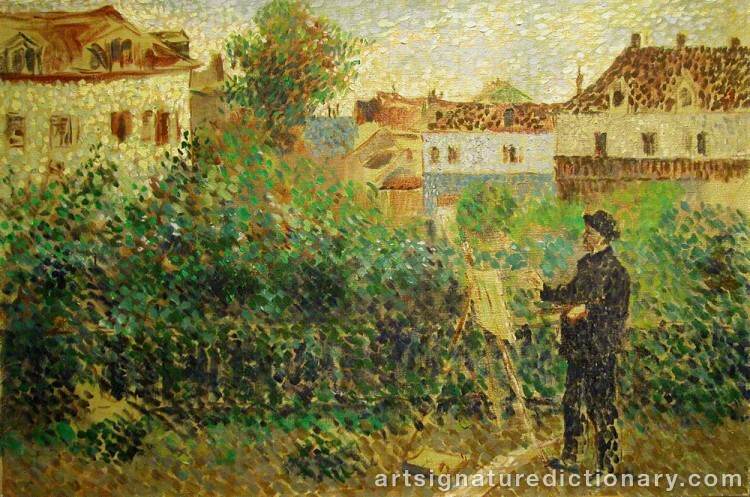 Renoir and Monet continued the practice established at Gleyre’s studio and painted together in the open air. Once again their close artistic collaboration was to prove fruitful, and each produced a number of works in which their practice is similar. 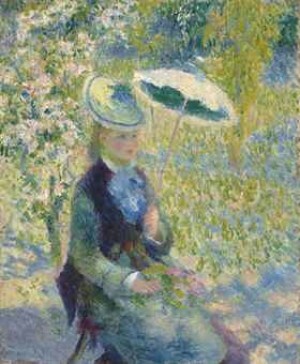 In Monet Painting in the Garden at Argenteuil Renoir demonstrates how far these private works have departed from the more ponderous style he adopted for Salon paintings such as Riding in the Bois de Boulogne. 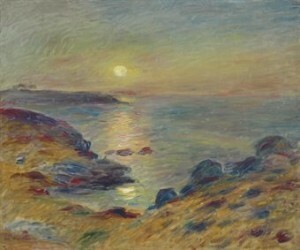 The following summer Monet, Manet and Renoir all worked together; this work is a testament to the impressionist credo. 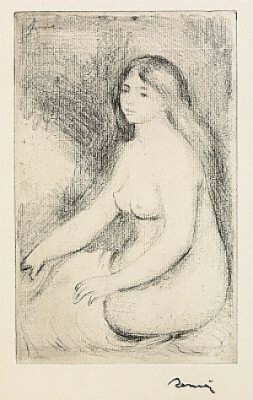 After the failure of the 1873 Salon, Gleyre’s former students and artists like Pissarro and Cézanne began seriously to consider holding an exhibition of their work which would be free of the constraints of the Salon system. 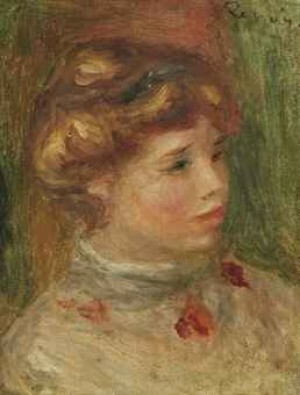 The financial independence which the purchases had offered the group meant that it was only Renoir who had continued to send to the Salon in 1872 and 1873. His continued allegiance to the Salon demonstrates that he considered it much more that simply a means of generation sales but as an important testing for his pictures. By the end of 1873 Renoir, Pissarro, Monet, Cézanne, Sisley, Berthe Morisot (1841-95), Degas (1834-1917) and other artists some of whom had already had a measure of success at the Salon, had registered themselves as a joint stock company. Manet did not join them, preferring to pursue his career at the Salon where he was beginning to have some success. 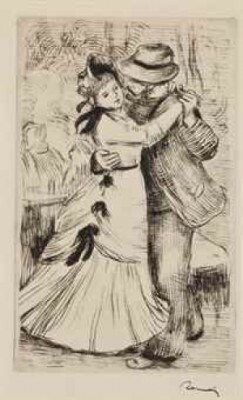 Renoir exhibited seven works, including Dancer, La Loge and the Parisienne. The exhibition opened on 15 April 1874 at a prestigious venue at 35 boulevard des Capucines, one of the great boulevards. The main aim at the exhibition was the freedom to exhibit work without the constraints of a jury system and any practical decisions which had to be made in the hanging of the works were taken democratically. The works were hung alphabetically; generally works were hung on one level, rather than according to the more hierarchical system adopted at the Salon. Although some of over fifty articles or notices in the press about the exhibition were critical, most found something worthwhile to say, if not about works themselves, then about the artists challenge to the stranglehold of official art exhibitions. 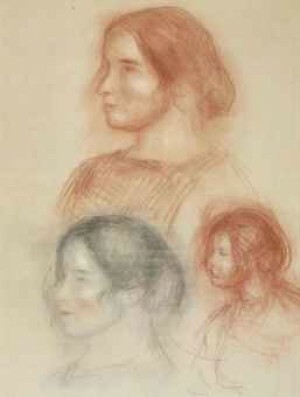 A number of writers used the word ‘impressionist’ in their articles to designate the group. 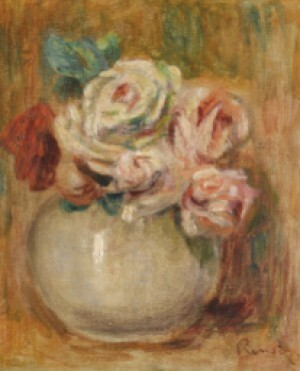 The exhibition was judged to be a success in terms of visitors but was a financial failure and Renoir was put in charge of the liquidation committee. They had no choice but to dissolve the company. Because of the need to clear their debts and in order to gain some publicity Morisot, Monet, Renoir, and Sisley decided to hold a public auction of their work in the Hôtel Drouout, the Parisian auction house on 23 and 24 March 1875. Renoir sold 20 paintings for a total of 2251 francs, some of them for as little as 50 francs, less than their reserve price. 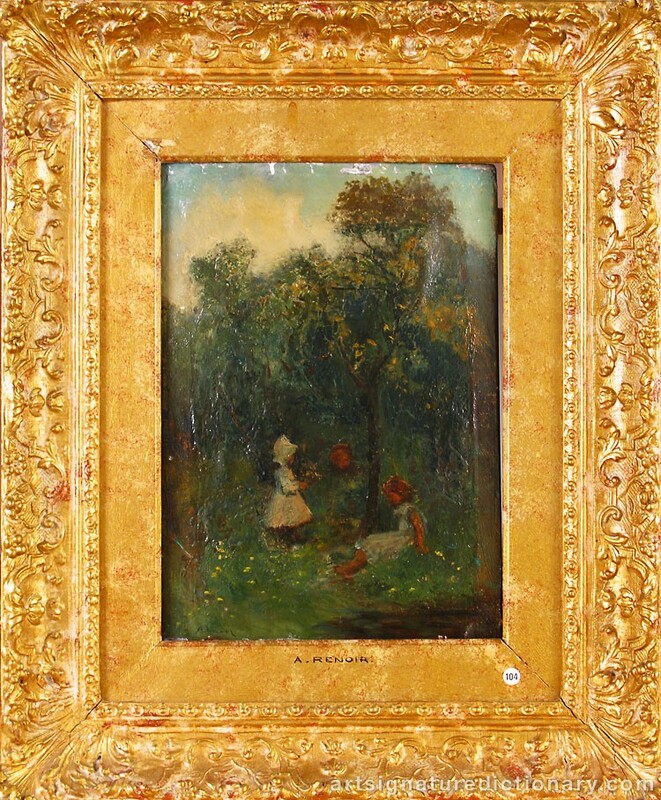 Shortly after the auction he received a commission from Victor Chocquet. Chocquet was one of the most important early collectors of works by Impressionist painters, particularly Cézanne, Monet and Renoir. 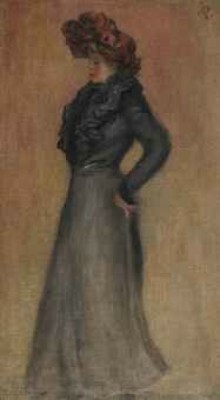 His first commission was a portrait of his wife Caroline. That some year Renoir was commissioned by the industrialist Jean Dollfuss to copy Delacroix’s Jewish Wedding in the Louvre for 500 francs. 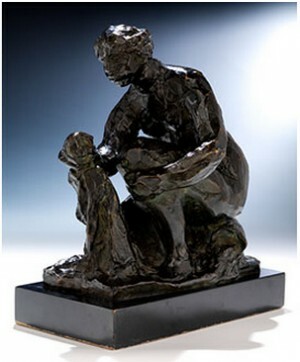 In April 1876 the second Impressionist exhibition was held. 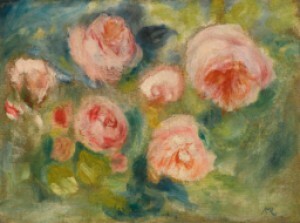 Renoir exhibited 19 works, six of which were loaned by Chocquet and two by Dollfuss. 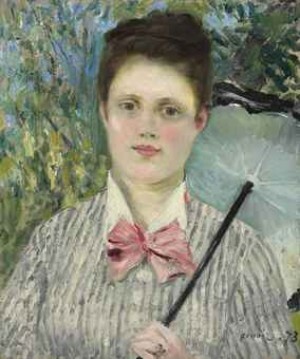 Manet was listed as the owner of Frédéric Bazille, Painter Killed at Beaune-la-Rolande. 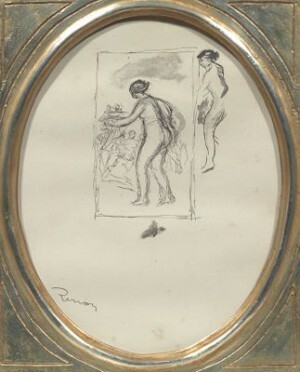 This summer Renoir began work on a major painting, sketching at the Moulin de la Galette in Montmartre and in the garden of a new studio he had rented at the top of the hill near the picturesque windmills. A that time Montmartre with its market gardens still retained some of the charm of its original village atmosphere, although the areas around were increasingly industrialized. 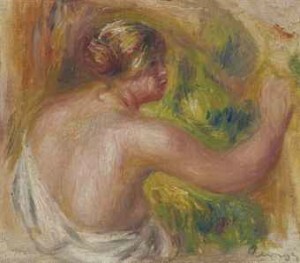 It seems that from the outset, Renoir regarded this work as a major artistic statement, akin to a Salon painting in conception if not in finish. He tackled it with the same degree of single mindedness, working it up from rough sketch through a much larger oil sketch to the finished picture. The Moulin de la Galette took its name from one of the old windmills which contributed to the rather rustic atmosphere which still prevailed at Montmartre at this time. Every Sunday afternoon young people from the north of Paris contributed in the dance-hall and in the courtyard behind it in fine weather. In 1877 the group realized the third independent exhibition and published their own journal. L’impressionniste was never properly a manifesto, and did not survive beyond the four issues produced for the exhibition, but it demonstrates the artist’s commitment to exerting as much control as possible over the promotion and reception of their works. 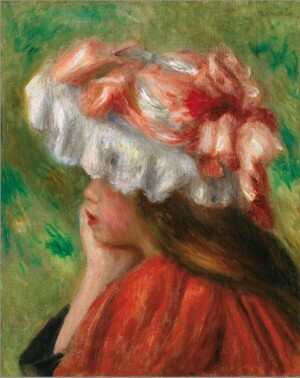 Renoir contributed to L’impressionniste with two letters. However, most of the journal was written and edited by Revière. Much at that we now know about Renoir’s work on the Moulin de la Galette derives from the account left by the civil servant and writer Georges Revière, who knew him well at this time. In 1878 Renoir was accepted the Salon, the first time for eight years, with Le Café, a genre painting of a fashionable young woman enjoying a cup of coffee. 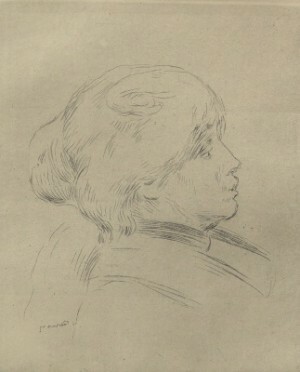 He showed four works et the Salon in 1879, including the large society portrait of Madame Charpentier and her Children. The portrait was hung in a prominent place at the Salon, mainly because of the intervention and influence of Mr. Charpentier, and was critically well-received due to writing of Pissarro who related that Renoir had a ‘great success at the Salon’, and Zola. 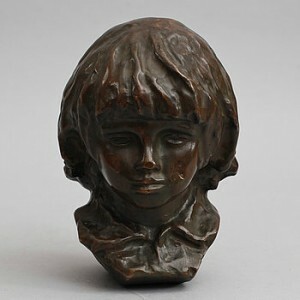 Marguerite Charpentier was the wife of the publisher Georges Charpentier and hostess of one of the most fashionable salon in Paris, at which Renoir was a regular guest. At the beginning of the Third Republic the most fashionable salon in Paris attracted a number of writers including Zola, Floeebert, Maupassant, Turgenev, the artist Manet, and the politician Léon Gambetta. 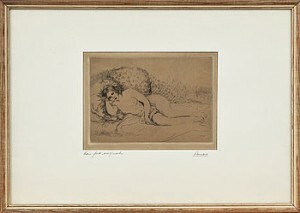 In April 1879 Georges Charpentier founded the weekly journal La Vie Moderne, devoted to art, literature, and society gossip and for which Renoir provided a number of illustrations. 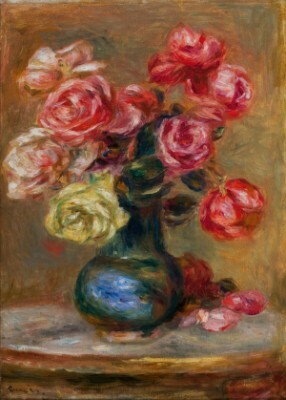 Auguste Renoir är, i synnerhet, känd som den stora kvinnoskildraren i nyare fransk konst. Kvinnan var genomgående motivet i hans långa och rika produktion Renoir använde länge och den impressionistiska tekniken med korta, åtskilda färgstreck. Vägen gick vildare genom studiet av d gamla mästarna. 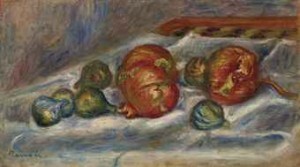 Renoir reste runt till museerna i Italien och frankrike och fick nya impulser från renässanskonsten och från klassicisten Ingres. Under åratal arbetade han med stora kompositioner över temat ”badande kvinnor”. Från de senare åren av Renoirs liv föreligger en mycket karakteristisk produktion av skulpturer, huvudsakligen runda mjukt fylliga kvinnofigurer, ofta i stort format. Deras tillkomsthistoria är märklig. Då den åldrade mästaren började bli ofärdig i händerna på grund av gikten och plågades av den påtvungna sysslolösheten, förslog konsthandlaren Vollard att han skulle ägna sig åt skulptur. Det var ett till syner absurt förslag, eftersom en bildhuggare behöver rörliga händer i ännu högre grad än en målare. Men Renoir fick till sig förfogande en ung skulptör som gav prov på en intuitiv förmåga av förverklige mästarens idéer och som på ett självutplånande säg ägnade sig åt at förmedla dess idéer till materialet. Renoir satt bredvid och pekade med en käpp fastbunden vid den förtvinade handen, och de skulpturer som växte fram kom att bära hans prägel i lika grej som mästarens målningar.